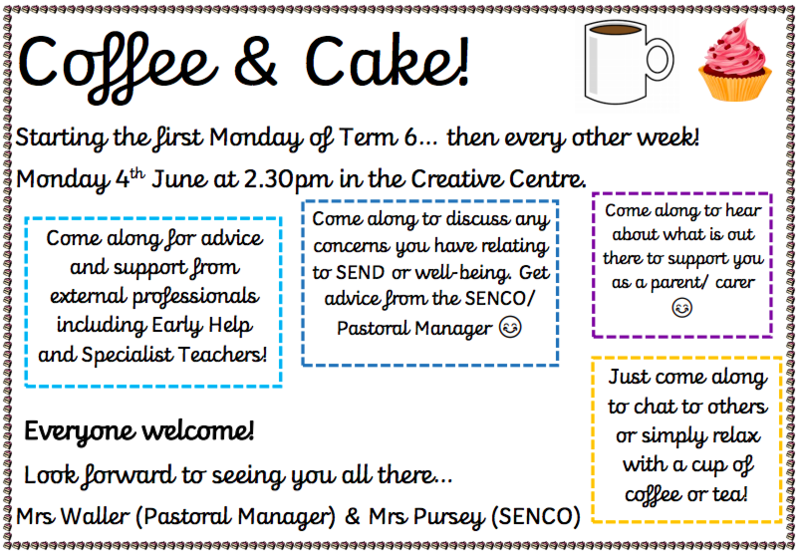 Here at St Richard's will be running a new parent group "Coffee and Cake" beginning Monday 4th June at 2.30pm. It will take place in the Creative Centre with plenty of refreshments available. It will be the perfect opportunity to discuss any concerns or worries you might have relating to SEN or well-being as well as share any ideas with other parents and carers. If you have any issues or topics that you would like covered, please shout so we can organise this for you before our first group. As the group continues, we will also be inviting external professionals to attend who will be able to offer specialist advice. This will include Early Help and Specialist Teachers. Mrs Waller and Mrs Pursey.